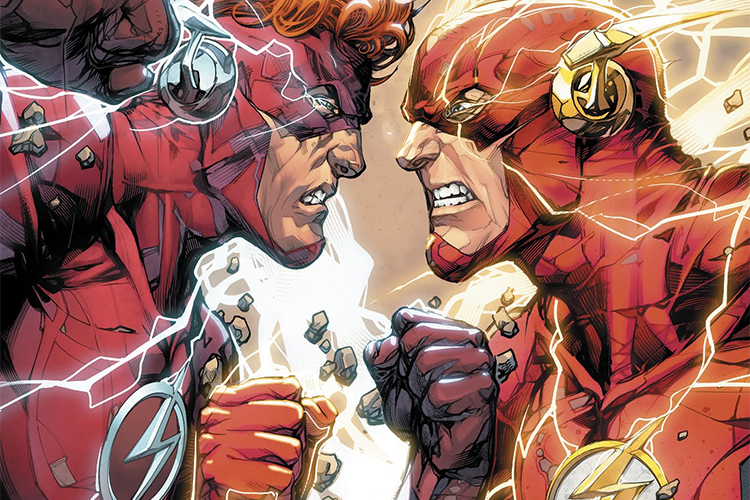 The Flash #47 marks the highly anticipated start of the Flash War event that DC Comics has been teasing for months, one which is meant to have “huge repercussions” according to Tom King. But before we can learn where it’s leading, we have to focus on where it begins, which is 47 minutes and 18 seconds from now. 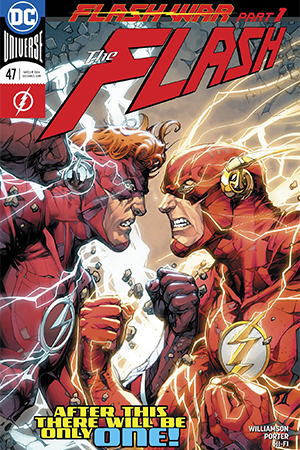 Wally and Barry are in the middle of a massive argument about whether to save unnamed people, with Wally desperate to create his own Flashpoint it seems and Barry just as desperate to keep his nephew from potentially making things worse. The exact circumstances aren’t clear, but it’s easy to see that something has shaken Wally to his core. Which is of course when Williamson rewinds to Iris and the younger Wally (whom I will now refer to as “Wallace,” like Iris does in this issue) fixing a motorcycle, not realizing the storm that’s about to hit their family. 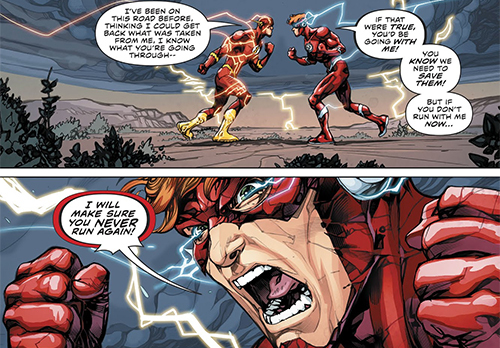 But as extreme as the argument between Barry and Wally feels on the opening page, the more surprising aspect of The Flash #47 might just be the trouble they’re having even before then. Barry is a little strict on which way he’d like to save the day while Wally is quite a bit cockier than one would think, and while the tension foreshadows their later fight it’s also strange given how well they left things at the end of the previous issue. Some of that might be due to Wally’s periodic memory spasms, especially as the latest ones focus on how he’ll never measure up to Barry, but overall the push-and-pull between the speedsters could have been done a little more organically. Their mutual ribbing – and Wally’s flashbacks – is quickly interrupted by The Renegades, a 25th century task force sent by Hunter Zolomon to arrest Iris for Eobard’s murder. Before I dive into the story of these newfangled Rogues, though, I’d like to take a moment and praise the writing for Iris West here. She’s not always a major part of the story arcs, but The Flash #47 not only let her drive some of the narrative but also leaned into her rather sparkling personality. Since her inception, “tough love” has been a perfect way to describe her, but sometimes it can be difficult to calibrate the sweet with the sour. Here, though, her protective nature meshes perfectly with her no-nonsense attitude in such a way that it makes total sense why Barry and both Wallys hold her in such high esteem. Pus, it’s just plain fun to see her chasing after Commander Cold on her bike. It’s moments like these where Howard Porter’s artwork shines, as his expert shading lends itself to the frenetic movement and energy that The Flash #47 needs to work. Not to mention that the color palette and tones provided by Hi-Fi complement both the artistic and narrative details quite nicely. Together, the art makes The Renegades look like exciting and interesting characters, which unfortunately the story doesn’t (yet) have the room to play with. Commander Cold being the leader feels right, but it also feels redundant given the dynamics of the Rogues in the present time. On the other hand, Golden Guardian being a Yellow Lantern is an unexpected twist that adds some extra oomph to the issue. It’s too bad that more couldn’t be done with the fear constructs she creates, especially as a battle between Wallace and his father might have brought out some poignant emotions. But there’s no shortage of family moments despite this, and it’s a joy to witness both Wally and Wallace go to bat for their aunt even as she berates the elder one for running away instead of facing his demons. And there is a particularly powerful scene of trust and friendship between Wally and Barry that underscores how painful their upcoming “war” will be. Since family is the theme of The Flash #47, it’s only fitting that it’s exactly what Hunter Zolomon uses to turn Wally against Barry for now. 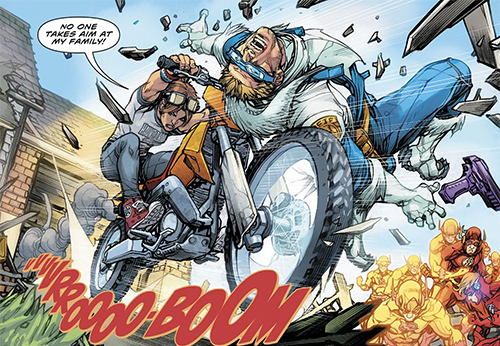 His reasons for wanting the speedforce destroyed and the Flashes at odds are still murky, but the panels revealing everyone from Bart Allen to Max Mercury to – of course – Jai and Irey are some of my favorites. The ending is a little abrupt, but it also paints a clear picture of how far Wally might go to save his kids. Verdict: 3.5 out 5 stars. There are some outstanding moments for Iris and Wally, but the tensions between him and Barry are too easily inflamed in The Flash #47. Nonetheless, it’s a promising start to Flash War, and lays the groundwork for an intense journey for the two speedsters specifically and the Flash family at large.